This is not meant to be an exhaustive collection. It consists mostly of non-mainstream media items that go into greater depth than the mainstream pieces one sees. Topmost is the most recent. The collection begins at the bottom of the list, with an interview that took place in 2012. There are quite a few postings on this site about the Fukushima nuclear disaster that began on March 11, 2011. This posting is being put up on the 8th anniversary of the beginning of the ever-ongoing nuclear disaster in Japan to remind us that this horrific disaster is still having far-reaching impacts on the people of Japan - & the world. Nuclear disasters have a beginning date … but they never actually end. Atomic Balm Part 1: Prime Minister Abe Uses The Tokyo Olympics As Snake Oil Cure For The Fukushima Daiichi Nuclear Meltdowns “There has never been a roadmap for Japan to extricate itself from the radioactive multi-headed serpentine Hydra curse that has been created in an underfunded, unsuccessful attempt to clean-up the ongoing spread of migrating radioactivity from Fukushima. Rather than focus its attention on mitigating the radioactive exposure to Japan’s civilians, the government of Japan has sought instead to redirect world attention to the 2020 Olympics scheduled to take place in Tokyo." Reality of Fukushima - 2019 - 8-minute YouTube featuring a resident of Fukushima Prefecture, discussing how it is on the ground, now. Official lies, denial of health impacts. Etc. Much ground covered in a mere 8 minutes. RECENT BOOK OF INTEREST PERHAPS? Confessions of a Rogue Nuclear Regulator, by Gregory Jaczko, former head of the U.S. NRC (Nuclear Regulatory Commission) - an agency like Canada’s so-called nuclear “regulator,” the Canadian Nuclear Safety Commission. There are many reviews of the book on-line. Here is one just published today. An earlier book - Fukushima: The Story of a Nuclear Disaster - is discussed in this August 2015 posting Fukushima: What Really Happened? Can’t Happen Here, though … right? The nuclear industry always has another scheme up its sleeve! They never solve the gargantuan problem of safely storing the insanely long-lived, extraordinarily toxic wastes their dirty industry has been busily creating for the past 70+ years. The latest scheme is Small Modular Reactors. SMRs. The claim is that these will help deal with climate issues. What’s closer to the truth is, the industry wants to ensure that those lovely, fat paycheques (supplied by generous government, that is to say, taxpayer-funded subsidies) keep rolling in. For the links below, note that they are listed chronologically, by date, with the topmost the most recent. ** A January 2017 DNA posting about Nukes & Climate here is entirely relevant. Next week (June 25-29) Canada’s nuclear “regulator” will hold a public hearing in Pickering, Ontario to hear all the pros and cons about OPG (Ontario Power Generation)’s plans to run this aging dinosaur of a nuclear generating station another 6 years. Well, they are saying 6 years at this point. Who knows what they'll say when 2021 or 2022 comes along?? In all likelihood they’ll want to extend the license yet again. That would not be the first time they've gone down that road. At any rate, next week = Pickering hearing time. Details from the “regulator” can be found here. Including the revised agenda. You can click on the ‘Download hearing submissions’ button, & I recommend you do! You’ll find many incredibly intelligent, enlightening submissions there. More on that in just a moment. Why do I say this license is “already in the bag”? 1. CNSC (Canadian Nuclear Safety Commission) never turns down a license request. It’s documented. By the CNSC! Here. You can find that CNSC staff CMD here. Read it for yourself! That gem of a paragraph (which certainly reveals a lot right off the top) is on page 9 of the pdf (pg. 1 of the Executive Summary). There are many “intervenors” (this just means human beings who decide to speak up at one of these intimidating shindigs) who have plenty of intelligent things to say. On a variety of fronts. DNA (Durham Nuclear Awareness) ** DNA has been calling on the provincial gov’t to do better nuclear emergency planning ever since the late 1980s. See this letter the group sent to the Province in 1997. DNA's submission can be found here & our supplementary here. Note: a short collection of media stories from 2011 - present day, about inadequate nuke emergency plans, is found down below. Louis Bertrand ++ one intervenor whose submission has unfortunately been excluded. There is simply tons of good information in these submissions! Of course too, there are many submissions (& there will be many presentations next week) from folks/bureaucrats/bureaucracies/companies that profit in some way financially from the operation of the Pickering nuclear station. It’s pretty easy to spot these for yourself. It doesn’t take the discerning citizen very much energy or time to figure out who is speaking the truth, & who is parroting phrases & lines that may very well have been fed to them. But there will be lots of intelligent truth-telling over the five days. While little of it is liable to have any (or much) impact on the outcome (as previously explained); still, there is power & inspiration in speaking the truth & in hearing truth spoken powerfully and well. So, if you can get there to support the brave intervenors, please do! (You can also watch the hearing via live Webcast. This will take place on Tuesday, June 26th, during the lunch break (12:30-1:30 approximately). Check out the Facebook event page for details. Who knows who-all may wind up attending? The timing (middle of a weekday & a work day for many) is not exactly ideal. But there may be some unexpected participants who will liven things up. We shall see! The rally will be fun. And there will be music! Secret report on toxic workplace at Ontario’s fire and emergency agency leads to change — but report remains secret, Kevin Donovan, Toronto Star, June 9/18. Are Ontario's nuclear emergency plans dead in the water? Michelle Adelman, NOW Magazine, Feb. 5/18. Ontario’s long-awaited new nuclear emergency plan falls short, Greenpeace says , Rob Ferguson, Toronto Star, December 28/17. Is Toronto ready for a radiation emergency? Daniel Otis, Toronto Star, Jan. 5/16. Ontario Power Generation under pressure to provide more information to residents as three-day mock emergency begins Monday. Kristin Rushowy, Toronto Star, May 26/14. Is Ontario Ready for a Nuclear Disaster? Tyler Hamilton, Toronto Star, March 18/11. **** Be sure to check out this great new collection of nuke quotes!! I’ve lost track by now of how many times OPG (Ontario Power Generation) has said the Pickering reactor complex (8 reactors, 6 of them operating, 2 in “cold shutdown,” right beside Lake Ontario, just east of the City of Toronto) is going to be shut down - only to change their minds later, & keep pushing it beyond its "design life." But now the plan is to run this aging complex yet another 10 years (or rather, another 6 years, but the request is for a 10-year licence). They refuse to let it die! Hearing time is coming up! Place: CNSC public hearing room, 14th floor, 280 Slater Street, Ottawa. Time: As set by the agenda published prior to the hearing date. ** note: this part is for the proponent (i.e., OPG) to tell CNSC tribunal members what its plans are. Some might call it a kangaroo court. * See below. ** See THIS page on the CNSC site for relevant documents, including the transcript of the April 4th, 'Part I' hearing. The archived Webcast of the April 4th hearing is here. ** note: this is the part the public gets to participate in, & say their piece. Some might call it a kangaroo court. * See below. ** In both cases, you can watch the hearing via Webcast. Go to the CNSC Web site & look around in the top middle section or upper right-hand corner for how to do this. ***** You can now download ALL of the submissions here. &/or, use this link to access hearing notice, (revised) agenda & for downloading submissions. They never turn down a licence request. So this licensing hearing is liable to be the usual slam-dunk for the industry. Listen, don’t trust me on this (though I’ve been attending CNSC hearings for 12 years now, have lost track of how many I’ve attended (TOO many), & have yet to see them refuse a licence request). Here’s the word from the horse’s mouth, okay? Never a single licence they’ve ever wanted to turn down. Here. ** Be sure to scroll down for a super-relevant quotation about nuclear hearings! Ontario Clean Air Alliance has a Close Pickering campaign. Check it out! ** plenty more on their site too! Including a series of short YouTubes by a retired Ontario Hydro scientist, an M.D., the head of OCAA, a radiation biologist, & others … on why the Pickering station should be shut down. More great info from Greenpeace. Nuclear ‘Elephants in the Room’ – a posting with information about a few of the “elephants in the room” with respect to the PNGS (Pickering Nuclear Generating Station). many links in that posting above, to other matters relating to nuclear emergency planning & plans. KI: truth or Lies? There is quite a lot of B.S. afoot on the subject of KI (potassium iodide) pills - this posting from October 2015 remains relevant. ** Lots of great quotations / insights about nuclear accidents on the DNA site, here. The Fukushima disaster in particular, & an ever-important, still-utterly-relevant article about Nuclear “Regulatory Capture” – A Global Pattern. 2 Fukushima Anniversary Events! March 12 & 15/18. Monday March 12, 7 p.m.
On March 11, 2011, the world’s largest industrial accident occurred – a triple nuclear meltdown – in Fukushima, Japan. An area up to 50 km was evacuated and 160,000 people displaced, most whom have yet to return. Plants and animals are genetically damaged . Hundreds of thousands of bags of radioactive soil are stranded around the countryside with no waste solution in site, and 300 tonnes of radioactive water flows into the Pacific Ocean daily, contaminating the food chain. The catastrophe is expected to cost the Japanese economy between $200 and $500 Billion. At this anniversary event we'll address a new report by Dr. Ian Fairlie, radiation biologist from the UK. His report considers what would happen if a serious nuclear accident, similar in extent to what took place in Fukushima, were to happen at the Pickering Nuclear Station just east of Toronto. The answer is alarming, exacerbated by the fact that Pickering is surrounded by millions of people. Greenpeace is also releasing a new report about Fukushima that will be shared at this event. We'll also discuss viable alternatives to nuclear power in Ontario, and brainstorm how to achieve a renewable future. Speakers include: Kyoko Yokama, Japanese citizen and filmmaker; Angela Bischoff and Jack Gibbons, Ontario Clean Air Alliance; and Shawn-Patrick Stensil, Greenpeace. There will be lots of time for questions and comments from the floor. This is a Joint Human Geography and Environmental Geography Streams Seminar. Human Rights are Environmental Rights, and Environmental Rights are Human Rights too. Thur. March 15, 7 p.m.
On March 11, 2011, the world’s largest industrial accident occurred – a triple nuclear meltdown – in Fukushima, Japan. An area up to 50 km was evacuated and 160,000 people displaced, most whom have yet to return. Plants and animals are genetically damaged. Hundreds of thousands of bags of radioactive soil are stranded around the countryside with no waste solution in site, and 300 tonnes of radioactive water flows into the Pacific Ocean daily, contaminating the food chain. The catastrophe is expected to cost the Japanese economy between $200 and $500 Billion. At this event we will address a new report by Dr. Ian Fairlie, radiation biologist from the UK. His report considers what would happen if a serious nuclear accident, similar in extent to what took place in Fukushima, were to happen at the Pickering Nuclear Station just east of Toronto. The answer is alarming, exacerbated by the fact that Pickering is surrounded by millions of people. We'll also discuss viable alternatives to nuclear power in ON, and brainstorm how to achieve a renewable future. There will also be a theatrical performance and short film. Speakers include: Kyoko Yokama, Japanese citizen and filmmaker; Angela Bischoff and Jack Gibbons, Ontario Clean Air Alliance. Theatrical performance by Broadleaf Theatre. There will be lots of time for questions and comments from the floor. The announcement was made without fanfare on December 21, 2017 – when all was growing quiet on the government/bureaucratic/personal front for most people – right before the long Christmas break. No media coverage … by design, perhaps? The announcement is here & within that item, you can click on a link to download the updated PNERP. There was a Toronto Star article published on December 28th. ‘Ontario’s long-awaited new nuclear emergency plan falls short, Greenpeace says’ “While other countries have strengthened public safety since Fukushima, it’s taken the Ontario government six years to maintain the status quo,” said Stensil." Nuke Emergency Planning in Ontario: who (REALLY) runs the show? Technically, it’s the responsibility of the Office of the Fire Marshal & Emergency Management (OFMEM) within the Ministry of Community Safety & Correctional Services. However, anyone who follows nukes in Ontario knows who really runs the show. OPG does. If you take a look at this old item (a presentation made to the Durham Regional Council in June 2014), one thing you’ll observe (on pg. 3) is how very many agencies, both provincial & federal (& regional & municipal as well, in fact) are “at the table” when nuclear emergency plans are made. Fact is, OPG dominates the whole show. DNA attended one of these meetings, back in November 2013. Who was around that very big table? A lot of very quiet bureaucrats, with OPG & CNSC sitting like head honchos at the head table. Minutes of the meeting (& all of these NEMCC – Nuclear Emergency Management Coordinating Committee – meetings) can only be obtained through time-consuming Freedom of Information requests. So it’s all quite a bit less than transparent, shall we just politely say, & gives every appearance of having the provincial government agency (theoretically) in charge of emergency planning in actual fact entirely subservient to OPG. However, one need not really “buy into” my take on this. You can deduce for yourself whether or we are properly prepared for a serious nuclear emergency here in the GTA … or, for that matter, up near the Bruce Nuclear plant on Lake Huron. The Province’s “discussion paper” is here. It was released in mid-May 2017, & people were able to provide comments on it until July. My understanding is that around 1500 responses to the plan were sent in to the provincial government. 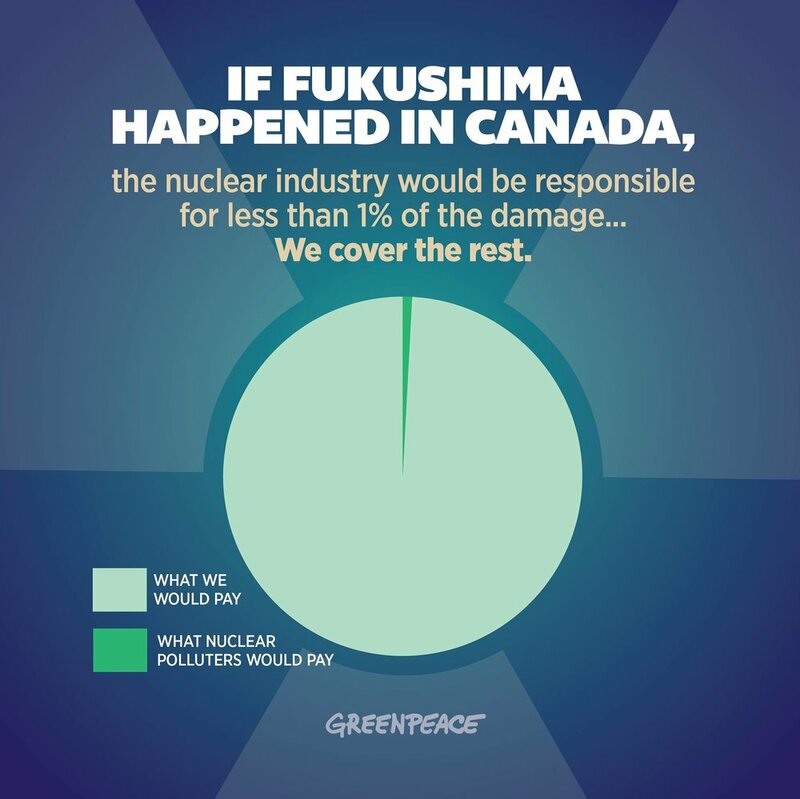 CELA – the Canadian Environmental Law Association – widely recognized for deep & wide expertise on all matters nuclear emergency in Canada, gave the proposed plan a ‘D.” You can see the CELA report card here. 40+ civil society groups endorsed a Call for Public Safety. Take a look at that here. With plenty of attendant media coverage – most of it listed here. So … Then What Happened? And then there was a nuclear emergency “exercise” out in Pickering on December 6 & 7. And the very day the “exercise” began, Ontario’s Auditor General released a report indicating that Ontario’s nuclear emergency planning is seriously deficient. “Neither Ontario’s emergency preparedness nor its nuclear response plans has been updated in almost a decade and budget cuts have trimmed staff and programs at its emergency management office, Auditor General Bonnie Lysyk, the province’s spending watchdog, reported. And there aren’t enough people trained to staff Ontario’s emergency centre for a crisis longer than two weeks, a cabinet committee overseeing emergency management hasn’t met in years and few ministry-level practice tests in the last five years involved simulations. The weakness in Ontario’s emergency planning and oversight make the province “vulnerable if a large-scale emergency were to occur,” the report said. “It is essential in a province the size of Ontario that the government be ready to act in the event of an emergency,” Lysyk said in a statement.” London Free Press, December 7/17. & then, on December 21st, the Province quietly released the revised PNERP. This took place last week. A four-person panel with two pro-nukers (basically) & CELA & Greenpeace spokespersons Theresa McClenaghan & Shawn-Patrick Stensil. Nobody explained why OPG was on the panel, when their responsibilities (theoretically) only extend out to the fence line at their nuclear plants. Other countries have upped their game, nuclear emergency planning-wise, in the post-Fukushima period, for example, in Switzerland (“The tablets are distributed as a precaution to all households, schools, companies etc. within a circumference of 50 km from Swiss nuclear power plants) & Belgium, also expanding the radius for KI pre-distribution there). Ontario? No beefing up of plans, no wider pre-distribution of KI (potassium iodide) pills. Vague commitments to "scale up" their plans for evacuations, say, if a really bad accident happens. Really??? Some recent items on the subject of evacuation – which one needs to know a bit about, given the possibility (& necessity) of evacuation after a major nuclear accident. Dr. Ian Fairlie (radiation biologist) released a report just a week ago (January 27/18), about the ins & outs of evacuation. Whether lengthy evacuations from large cities are feasible? “And how long would evacuations need to continue….weeks, months, years, or decades? The time length of evacuations is usually avoided in the evacuation plans seen so far. In reality, the answer would depend on Cs-137 concentrations in surface soils. The time period could be decades, as the half-life of the principal radionuclide, Cs-137, is 30 years. This raises the possibility of large cities becoming uninhabited ‘ghost’ towns like Tomioka, Okuma, Namie, Futaba, etc in Japan and Pripyat in Ukraine. This bleak reality is hard to accept or even comprehend. However, it is a matter that some Governments need to address after Fukushima. .... is letting the nuke plants keep running, even in the face of a multiplicity of overarching reasons why they should be shut down … pretending they actually have nuclear emergency plans worthy of the name … & simply raising the amount of radioactivity to which it is “acceptable” to be exposed (“acceptable:” a favourite weasel word in the industry; along with “robust,” of course) – & letting us all rot in our houses, sucking up the fallout, should a serious accident occur. I only wish I were making this all up… But, as previously referenced, I see what I see, & I know what I know. “The porch light is OFF, & NOBODY’s minding the store.” Nobody. Keep those fingers crossed, everyone! And hope the proverbial you-know-what does NOT hit the proverbial fan here in the GTA. It sure wouldn’t be pretty…. “It can’t happen here” … eh? Bottom line? Ever since the Fukushima disaster began in March 2011, the nuclear industry has been working to increase the levels of radioactivity considered "acceptable" for people to be exposed to. Looks as though the real plan behind the scenes is, if there is a big nuke accident, "the authorities" will just tell everyone "Nah, no worries! Just stay home. The levels of radioactivity are nothing to worry about. Sit tight." That idea is explained, and debunked, in the 17-minute video. Fukushima: the story of a nuclear disaster (fabulous book!) This very detailed, very helpful book outlines the progression of the Fukushima nuclear disaster thoroughly – and also lays out very carefully how U.S. nuclear regulators have carefully promulgated the “It can’t happen here” myth – ever since the Three Mile Island meltdown in March 1979. “I still believe (evacuation planning) is one of the most unplanned things,” Keen lamented.” – Linda Keen, former head of the Canadian Nuclear Safety Commission, quoted in this article 'Is Ontario ready for a nuclear disaster?' in March 2011, a week into the Fukushima disaster. Upcoming Event: Dec. 5th: Nuclear Accidents Happen - Then What? Tuesday, Dec. 5, 7 - 9 p.m.
** Note: This venue is an easy walk from the Pickering GO station. Are Ontario's plans for nuclear emergencies up to snuff? Many of us think not. Come & learn what "the authorities" are doing (or not doing) to protect us all in the event of a nuclear emergency. On December 6th & 7th, OPG & 30+ agencies (municipal, regional, provincial & federal) are conducting a big "emergency exercise" at the Pickering nuke plant. Do you know what to do in the case of a nuclear explosion? What should we ask of our governments and OPG in order to be properly prepared & protected? Join us for a community conversation!